Poetry can be can be used to reflect on the past, much in the same way that archaeology provides us with a physical interpretation of history. There is also a romanticism to archaeology, in the ruins of buildings or holding an artefact for the first time in hundreds of years, that can be seen in many poetic styles. Robert wished to highlight this and inspire the visiting poets to create their own artistic interpretations, influenced by the excavations at Berkeley. 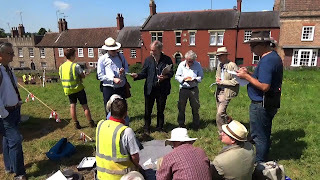 As part of the tour of the site, Robert showed the poets archaeological artefacts from previous seasons at Berkeley including Gloucestershire slip ware and worked flint. Robert used poems from the Classical era to the present day as the basis for discussions of taphonomic (the study of processes, such as burial, decay and preservation) processes, materiality and temporality (existing within or having some relationship with time). These are themes present in poems such as Heaney's work, 'Grauballe Man,' or the Roman poet Lucretius's De Rerum Natura.When asked which elements of archaeology they found the be the most interesting many of the poets, such as Tim Burroughs, noted the paradox of archaeology - the destruction of history to better understand and record it. 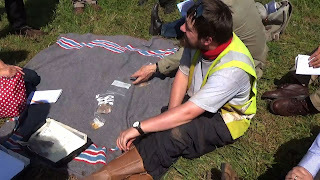 Martin Rieser also commented on the artefacts and layering of history in the trench. Some, as will be seen, were interested in the notion of 'the uncanny,' while others have been captivated by the reality of past lives that archaeological excavation can bring to the surface. Over the next few posts we will be sharing poems written by the Lansdown poetry workshop that were inspired by the excavations and archaeology of Berkeley. Some of these poems are still in draft form; they will be subjected to their own complex processes as they are reworked and rewritten. Keep checking the blog over the coming weeks for even more poems! Layered away from curious eyes. Robert Beavis showing finds to the poets. Credit: Diane Taylor 2017.